NEW YORK, Dec. 4, 2015 (GLOBE NEWSWIRE) -- The Global Awards℠, for the World's Best Healthcare & Wellness Advertising℠ announced the 2015 award winners today at ceremonies taking place at New York Academy of Sciences in New York City and at the X Studio Sydney Australia. McCann Health was awarded the coveted titled of Healthcare Agency Network of the Year for the fourth year running. The network was in the winner's circle earning 4 Global Awards and 19 Finalist Certificates. Agency offices honored include: McCann Health South Africa with 2 Global Awards and 4 Finalist Certificates; McCann Health Japan with a Global Award and 5 Finalist Certificates; and McCann Echo North America earned a Global Award and 2 Finalist Certificates. Global offices honored with certificates include: McCann Health India, McCann Health Dubai, McCann Health London, McCann Health Shanghai, McCann Torre Lazur and McCann HumanCare, USA. 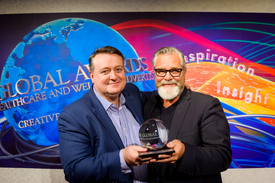 "To deliver and be recognized for great work from one agency is an achievement in itself, but to win a prestigious award for great work coming from multiple offices in a global network is a testament to the strength of our agency and our valued client partners" said Jeremy Perrott, Global Chief Creative Officer, McCann Health. "The Global Health Awards represent what our industry strives for: innovative thinking, diligence, passion, and commitment to creativity as both skill and art. Winning the Global's Healthcare Agency Network of the Year Award for the fourth consecutive time would not have been possible without our talented teams and our clients' terrific support and belief in our work around the world." Philip Chin, Chief Executive, Langland had this to say about Langland being awarded the 2015 Global Healthcare Agency of the Year. "We are thrilled that the work we do for our clients has been recognised internationally. The standard of creative work this year which reached shortlist and beyond was exceptional. Our congratulations go to all of the winners. To win Global Healthcare Agency of the Year for the fourth time is a brilliant achievement and testament to the hard work put in by the Langland team and the trust placed in us by our clients." "The Globals gives us the opportunity to see how we stack up creatively against the rest of the world. To once again receive the accolade of Global Healthcare Agency of the Year is both a huge honour, and a solid indicator that we are doing something right," said Andrew Spurgeon, Executive Creative Director, Langland. "Making work that is well regarded by our industry peers, whilst demonstrating to clients that we are an agency that believes in the power creative ideas." Downtown Partners Chicago earned the 2015 Grand Global Award for "The Luck Plan" for client Get Covered Illinois - Illinois Health Insurance Marketplace. The campaign targeted millennials and encouraged them to take notice and sign up for health insurance through Obamacare. The award-winning campaign engaged the sought-after millennial target audience and resulted in enrollment rising 60% over the previous year. "To see our work chosen amidst such competition is really incredible. We're humbled and extremely honored to receive such a prestigious award." Agencies from the United States were center stage and led the pack with 11 Global Awards. Global Award winning agencies include: Area 23 New York with 3 Global Awards, 2 for "Killer Tan" for Mollie Biggane Melanoma Foundation (Mollie's Fund) and 1 Global Award for "The State of Diabetes – Posters" for The diaTribe Foundation. In addition, the following agencies earned Global Awards: Aetna earned a Global Award for "The 11 Initiative"; CP+B for "Taste of the Future" for client Aspen Dental; GKV for "In My Room" for client MJHS Pediatric Hospice; McCann Echo "Soolantra: Introducing a Tough Topical Animation" for Soolantra/Rosacea; and Saatchi & Saatchi Wellness for Crossroads Community Services "Street Fare Sanitation Truck Posters". Starcom Mediavest Group was honored with 2 Global Awards for "Out the Monster" for Orexo; and Tribal Worldwide for "DXM Labworks" for Consumer Healthcare Products Association & Partnership For Drug-Free Kids. Australia tied with the United Kingdom with each country taking home 7 Global Awards each. Saatchi & Saatchi Sydney earned 4 Global Awards for "Penny The Pirate" for client Luxottica / OPSM. Additional Australian agencies earning Global Awards include: Saatchi and Saatchi Health Sydney for "Noodle Critter" Vivaxim/Vaccine Awareness; H &T Melbourne (The Healthy Thinking Group) "Australia's Top Foot Model" for SolvEasy tinea cream; and Showpony Advertising Australia "Hands Off Our Ambos" for client SA Health. United Kingdom agencies earned 7 Global Awards. Langland was in the winner's circle with 4 Global Awards for "Sniffers" for Confidante and 2 for "Jinarc MOA" for client Jinarc. Saatchi & Saatchi Health UK earned a Global Award for "The Nightmare Boss" for client NovoMix, Novo Nordisk. Singapore earned a total of 5 Global Awards in this year's competition. Grey Group took home 3 Global Awards for "Life Saving Dot" for Talwar Traders. Talwar Bindis, in association with Neelvasant Medical Foundation and Research Centre, introduced The Life Saving Dot, Jeevan Bindi, an idea that transformed bindis into iodine patches. Grey Group was also recognized with an additional 2 Global Awards for their entry "Unfold the Child" for client ST. Andrew's Autism Centre. Brazilian agencies earned top honors with 3 Global Awards this year. Vetor Zero / Lobo was honored with 2 Global Awards for "War on Drugo" for client Global Commission on Drug Policy and NBS Brazil earned a single Global Award for "Priceless Pets" Animal Health for client Purina / Quatro Patinhas NGO. South Africa's entries from McCann Health "Roadblock" and "Breathless Moments" for client AstraZeneca Respiratory were recognized with 2 Global Awards. France, Japan, and the United Arab Emirates were recognized with a single Global Award. Agencies include: HAVAS 360 France "Whatever Happens" for client Mercurochrome; McCann Health Japan "84 Stations of the Treatment Road Poster" for Sovaldi; and Mubadala United Arab Emirates "On the Shoulders of Giants" for Cleveland Clinic Abu Dhabi. Teenage Mutant Ninja Turtles Rev Up and Sprint Into Action - Now That's Fast!